Can you believe I received a Christmas issue of one of my monthly magazines in the mail recently! And here I was still looking for autumn mantel ideas! My autumn mantel is now complete, but I still need to edit the photos so I will be sharing it next week. I did want to share with you 12 gorgeous mantels just in case you still haven’t styled your own mantel. 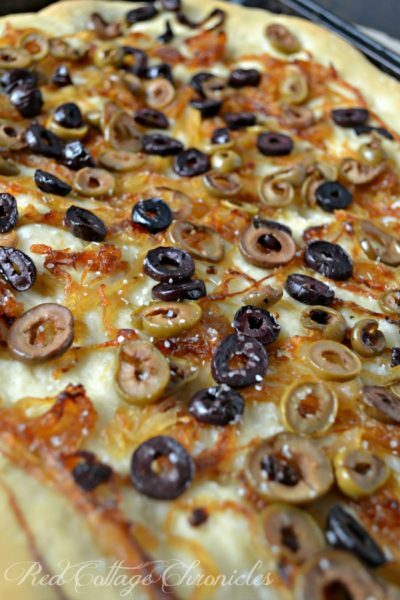 You will find a variety of styles and themes. In fact, there is even autumn mantel ideas if your mantel doesn’t happen to sit over a fireplace! Be sure to click the links below each photo to see each mantel in detail and pin the mantels that you love directly from the source! 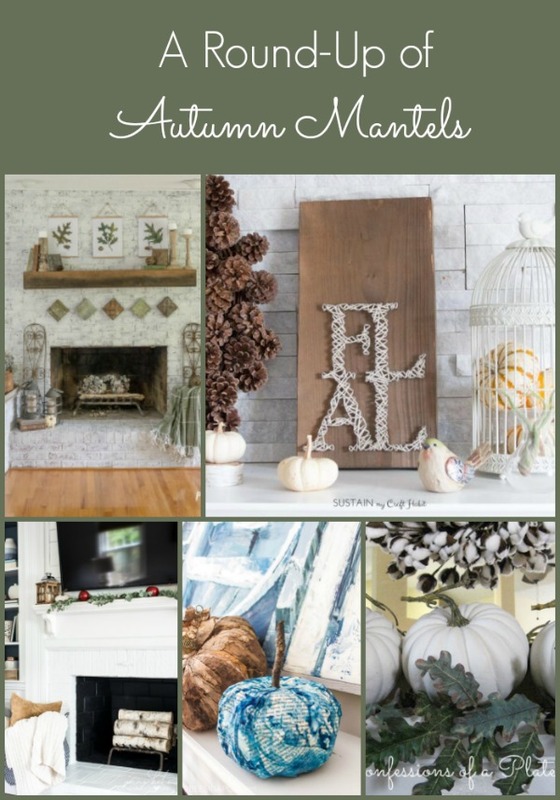 These ladies deserve all of the credit for their creations and I appreciate them allowing me to share their autumn mantel ideas with you today! 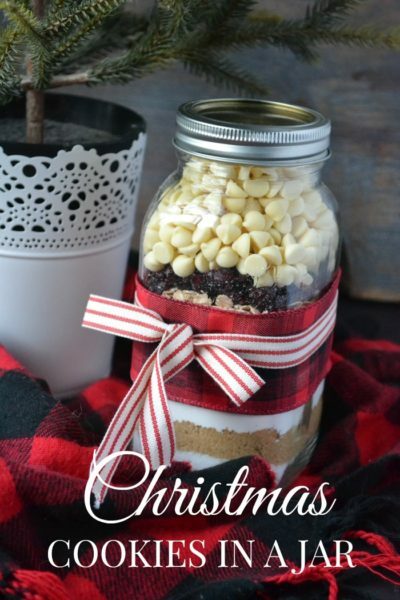 I have a pinable image at the bottom of this post if you want to save the collection and visit (and pin) each mantel when you have more time. 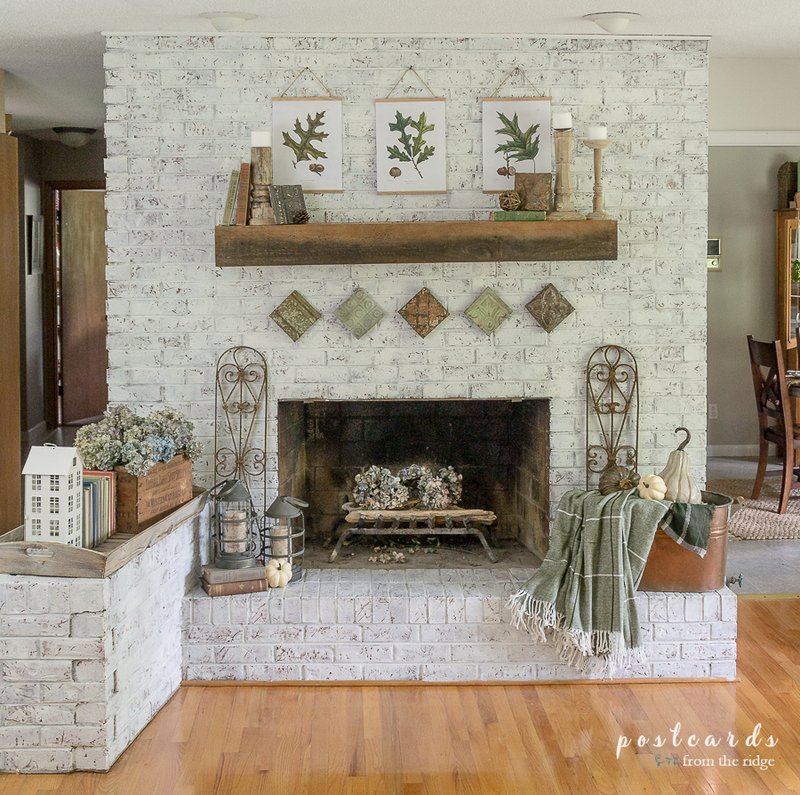 I love this entire fireplace with its’ whitewashed brick and chunky wood mantel. Postcards from the Ridge has dressed it up with natural elements and she even offers free oak leaf printables like the ones she has used here! This mantel is simply stunning. I love the use of blue paired with the natural pumpkins and bold wood candlesticks. 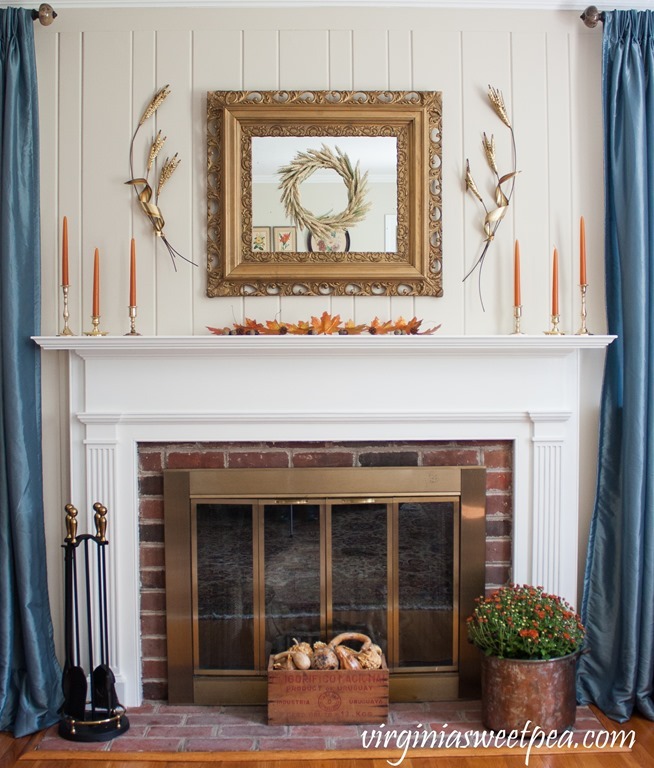 The artwork is gorgeous and the perfect backdrop for this autumn mantel. 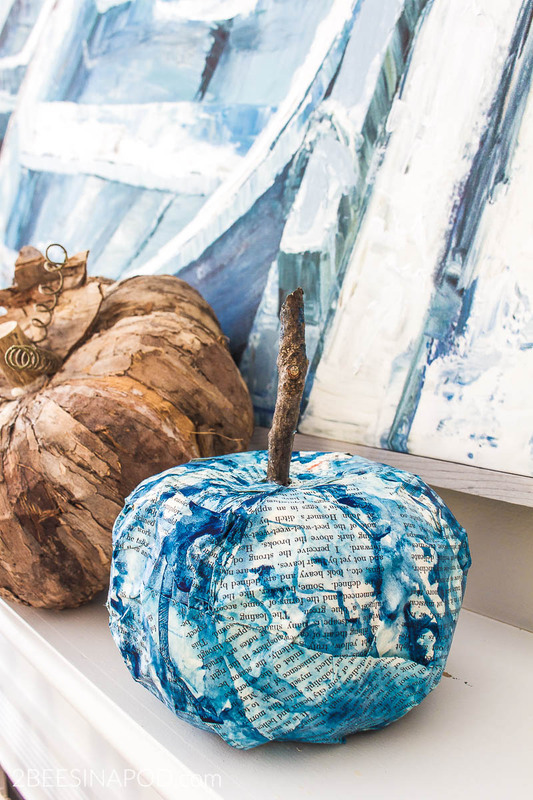 There is even a link to learn how to make the indigo book page pumpkin! Jenna Kate at Home has done a wonderful job of showing how a simplistic style can still have a big impact. 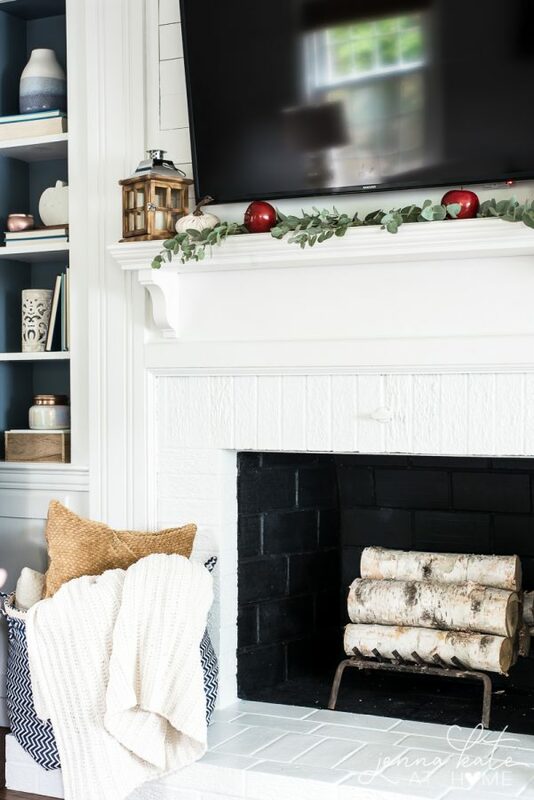 What I love most about this mantel is how easy it would transition into seasonal winter or holiday mantel with just a few tweaks! This mantel is another example of how well natural and neutral elements create the perfect autumn vignette. 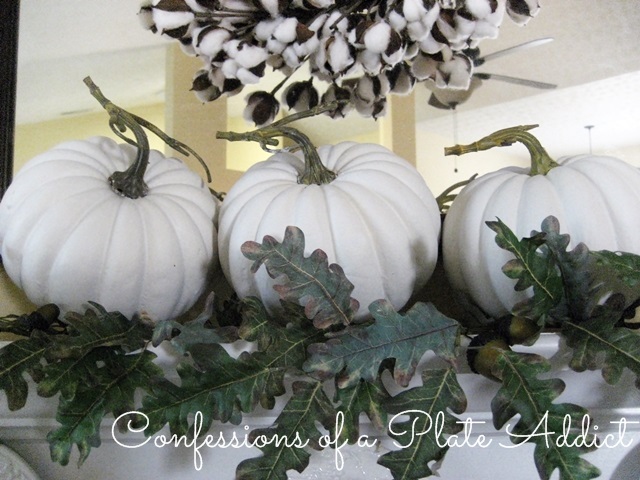 Create and Find shares how to turn simple dollar store pumpkins into showcase neutral mantel decor. 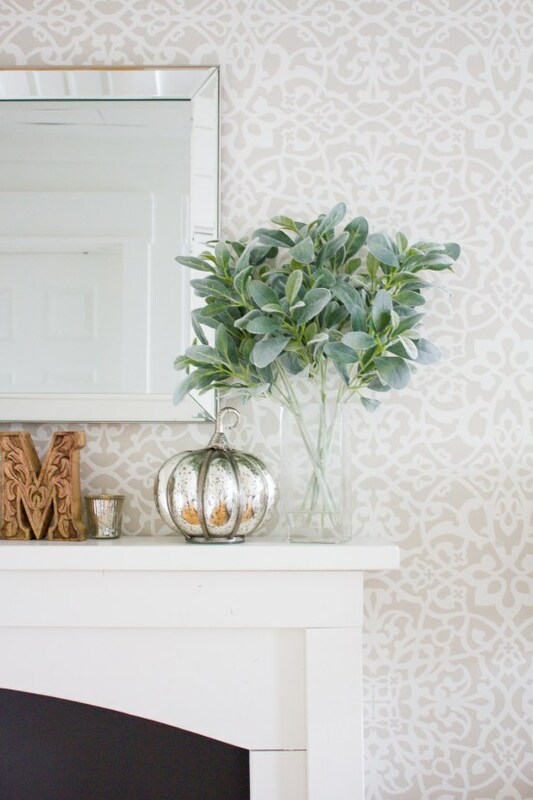 This pretty mantel is grounded by a trio of white pumpkins nestled in a bed of oak leaves. The contrast is eye catching. The use of beautiful galvanized lanterns complete the look. 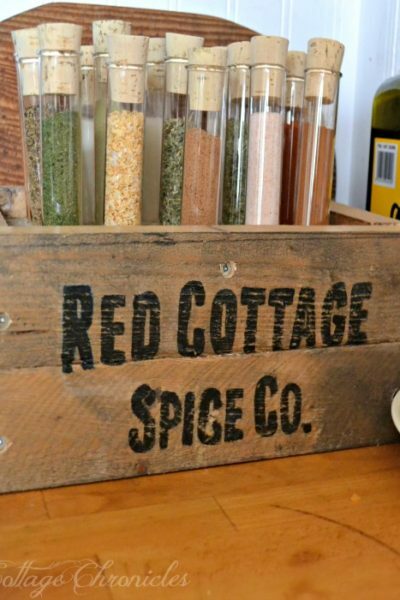 It is no secret that Farmhouse is a favorite decorating style. 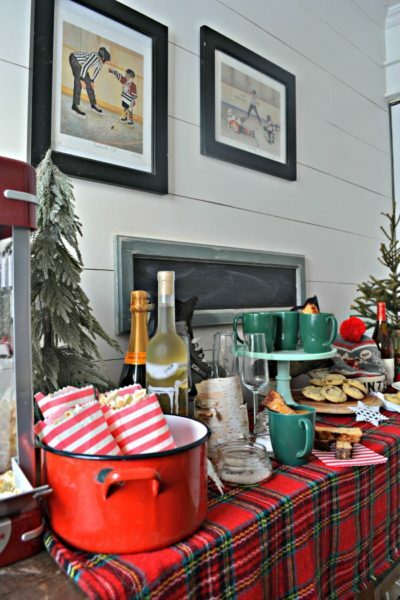 Marianne from Songbird nails the look even though she doesn’t have a traditional mantel over a fireplace. 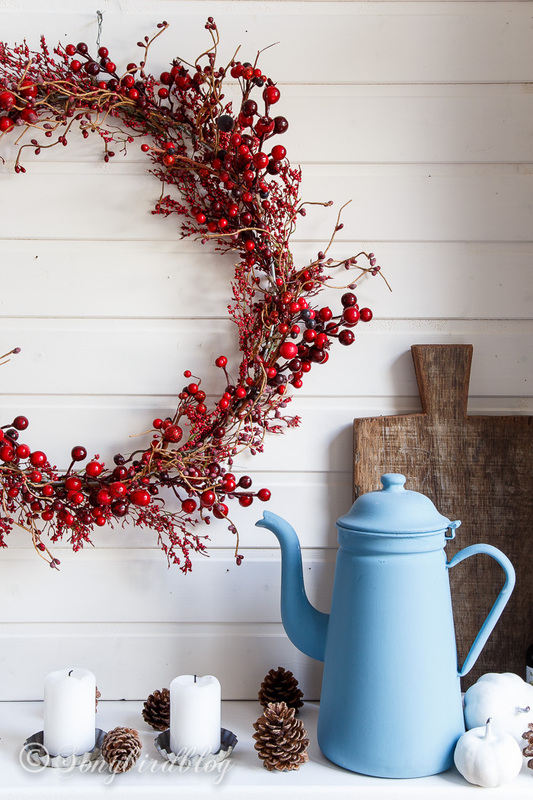 She styled a shelf that includes so many fun farmhouse elements and the red berry wreath against the shiplap wall is the star of the show! 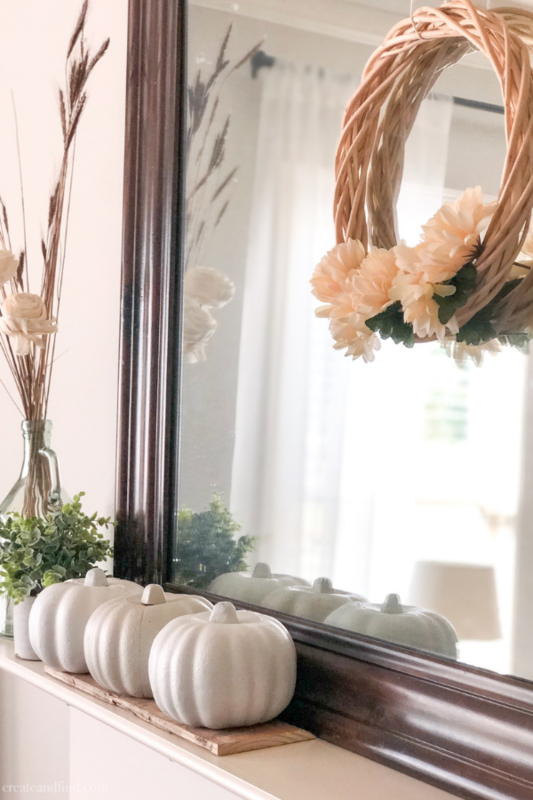 This pretty autumn mantel from Sweet Pea is the epitome of classic and vintage all rolled up into one I am in love with those gorgeous vintage wheat branches on either side of the mirror. Simple orange tapers in traditional brass candlesticks perfectly frame this autumn mantel. This narrow mantel from Making It In The Mountains is adorned with a mixed medium of neutrals. Greens, wood and mercury glass elements make for a gorgeous mantel. And, wait til you see what room this mantel is in. Lucky girl! 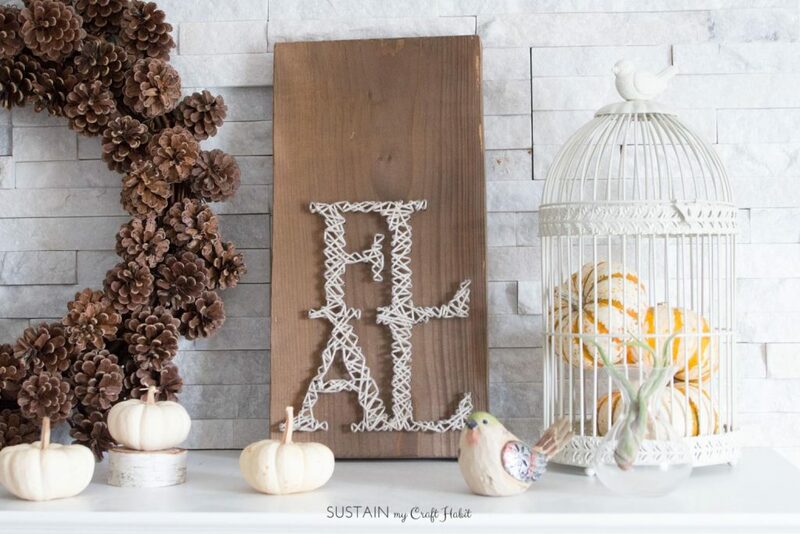 Sustain My Craft Habit shares a tutorial to make easy string art to decorate your mantel for fall! I love the little pumpkins in the bird cage too! 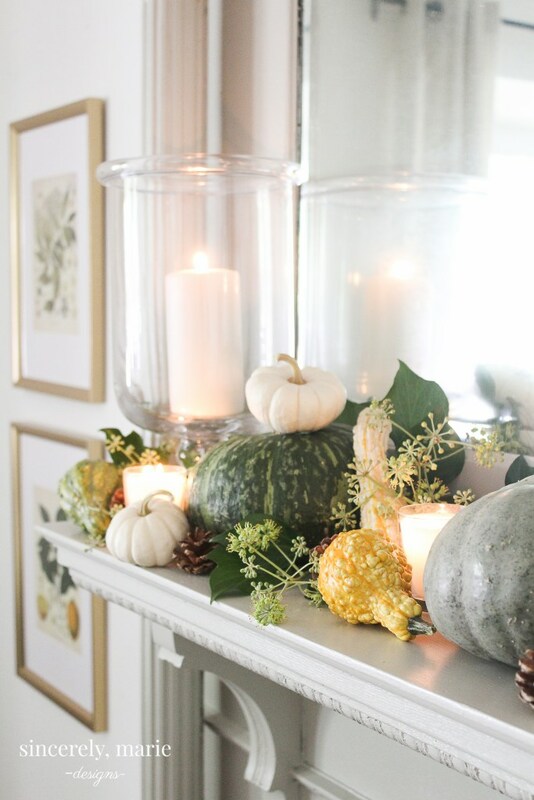 I love how Sincerely, Marie Designs uses fresh gourds, greens, and tiny white pumpkins, and pinecones to embellish her mantel for autumn. The twinkling candles are the perfect touch to her natural fall mantel. And finally, it is always fun to use lamps as mantel décor. Paired with mercury glass I can imagine how pretty this mantel is at night. 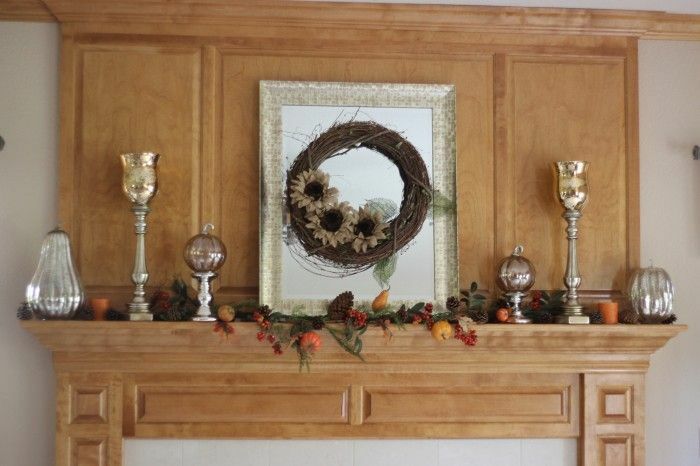 And, Momcrieff shows us how to hide those pesky wires with her pretty traditional autumn mantel! I hope you have been inspired as I have by all the lovely mantels. 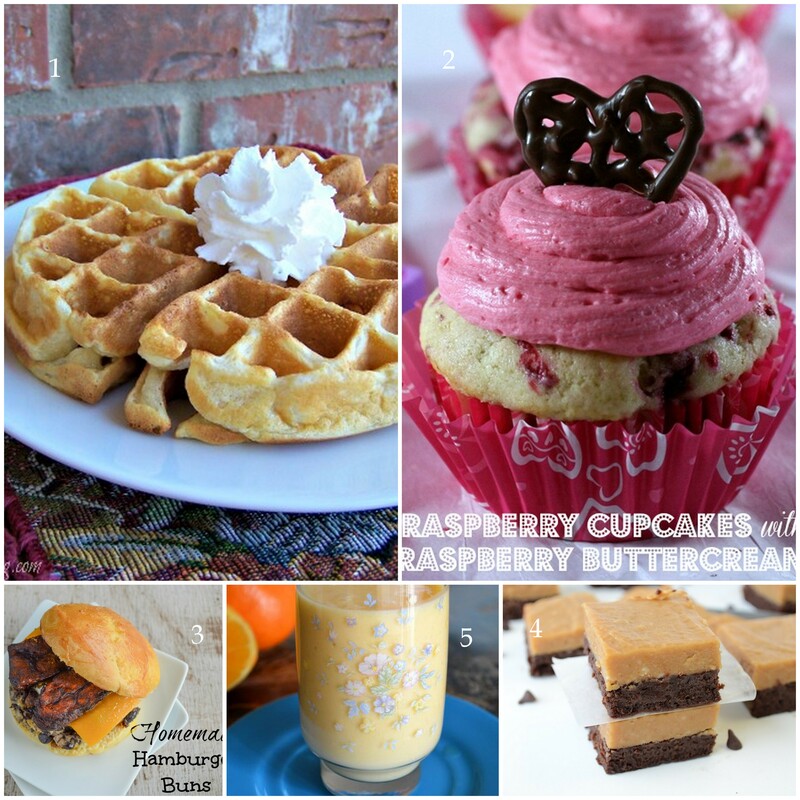 Be sure to check out my shop for some of my favorite autumn finds.